What do you do if your Adelaide carport is too small? If your one-car family has recently become a two-car family and the single carport just won’t do anymore? For most people the choice would be to simply tear down the old carport that’s too small and build a larger carport. A good solution and Mr Carports in Adelaide can certainly help achieve this. However, if your existing Adelaide carport is in good condition there may be another solution and that’s to do something that is common in the building trade but less common when it comes to carports… Extend! It may be a little out of left field and won’t suit all situations, but extending your Adelaide carport is worth considering. If you have a single carport, Mr Carports can turn it into a double carport. If you have a double carport, we can extend to make space for a caravan or trailer, and so on. There are two main ways to extend a carport. One is to match you existing carport by using exactly the same materials and the same style. The goal outcome is for a carport that will simply be bigger without looking like it was extended at all. 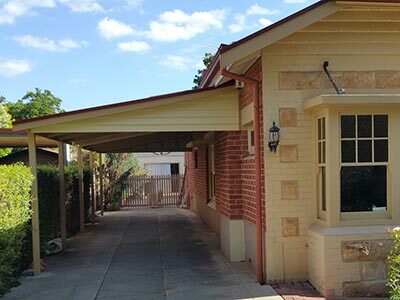 The other is to complement your existing Adelaide carport and use different materials and even perhaps a different style of construction. A bit like adding a modern extension to an existing older-style house, if you like. It’s certainly more difficult to do this successfully, but with careful planning it can be done and the result can be outstanding. An example of a carport extension was completed by Mr Carports when a homeowner needed to extend his carport to make space for another car, a collector’s item from the United States. The homeowner’s existing carport lent itself to an extension that perfectly matched the existing carport. This was achieved by matching the carport design and using the same structures and materials, including brick piers, beams, roofing material and flashing. This was further augmented by the addition of a stencilled concrete floor to match the floor of the existing carport. It’s fair to say that the extension looks so much like the original that’s it’s difficult to tell the two apart! Is a carport extension the best solution for you? Give Mr Carports a call on 1800 557 782 to discuss. We can help build any style, size or shape of carport extension and give you the advice you need. Our Adelaide branch is ready to help. ‹ A Sydney carport that’s just right!